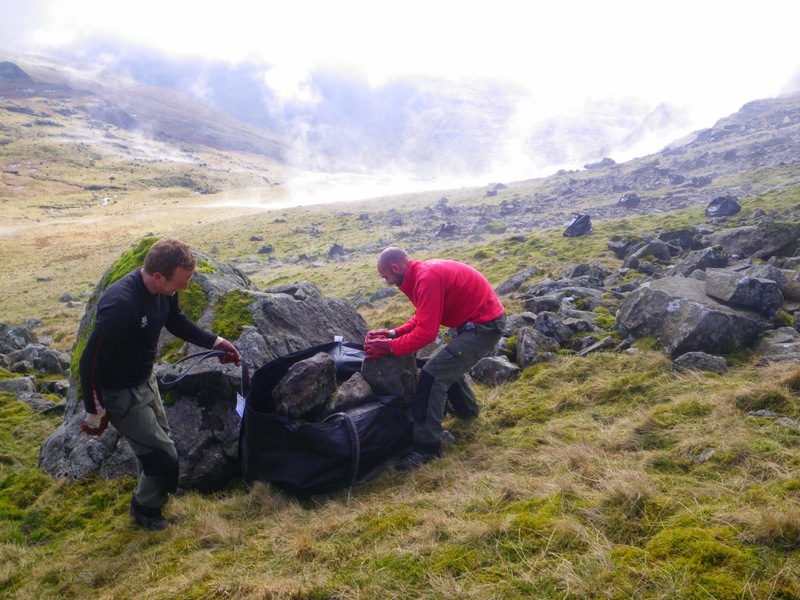 This weeks blog comes from the South Lakes Upland Footpath team and comprises some of our favourite photographs from 2014. How many Upland Rangers can you spot? In the winter we come down from the fells and spend most of our time working in (equally beautiful) lower level countryside. 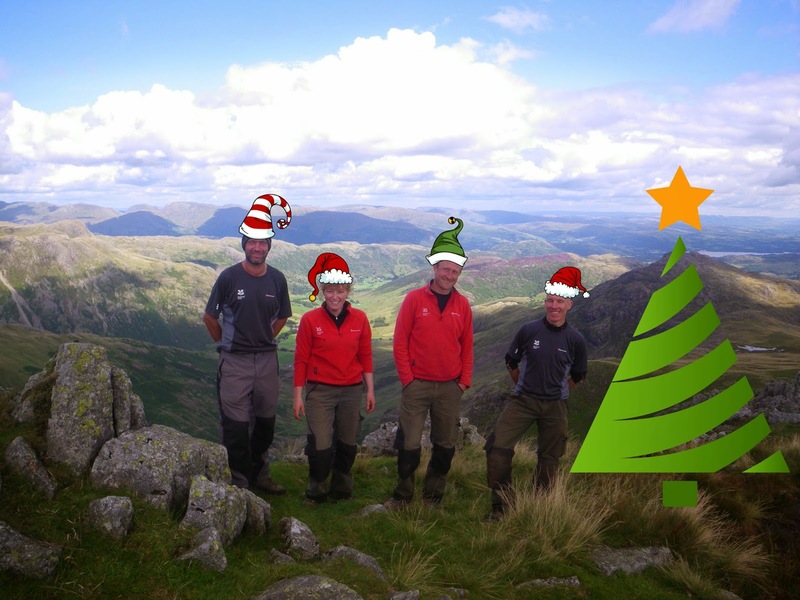 For more pictures or to know more about the daily work of the South Lakes Upland Ranger team why not follow us on Twitter @NTLakesFells. Once again, as we approach the end of another year, I have been reflecting on what has been achieved and once again I realise just how much has depended on the fantastic volunteers who work with me. Some of the work has been creative in that we have started with an idea and have made it a reality. I think of the play trail in Cockshot Wood that has taken many hours of hard work. Our reward is to see so many children (and a good few grown-ups) enjoying themselves in the wood. Some of it has been stewardship in that we have worked to protect the best features of the area. I think of the work done to maintain good surfaces on the paths so that there is good access for as many people as possible. It just would not be possible for me to do all of it without my groups of volunteers. The National Trust is fortunate in having thousands of committed and gifted volunteers and I know I am lucky to have mine. So now is the time to say a HUGE THANK YOU. I’ve decided not to be a rescue dog. I am going to concentrate on being a ranger dog. The sheer diversity of people that stay here demonstrates what a welcoming and inclusive place High Wray is. But sometimes we get a guest that we just wish hadn’t come in the first place and that we can’t wait to get out of the door. Well, that doesn’t sound very ‘rangery’ does it? But when the guest in question is a bird that files in through our door and gets stuck in the kitchen we hope you’d agree with us. It doesn’t happen too often, but when it does we’re normally alerted by the tapping and flapping sound of the panicking bird desperately trying to batter it’s way out of our windows. This is upsetting for both the bird and us so we try to get it out as quickly as possible. Most of the time we can leave the door open and slowly ‘herd’ the bird towards it, but this doesn’t always work so sometimes we need to capture it. It’s tricky, but there’s certain ways to do this that minimize the chance of harming the bird and once you have them (carefully) in your hand it’s surprising how calm they appear. Sometimes though this may be because they’re a bit dazed as with this Wren that we recently caught, which is why it’s just sat on a hand without flying off. We put this one down outside the door and it had gone 10 minutes later so we think it just needed to get it’s breath back. It’s not just small birds though. 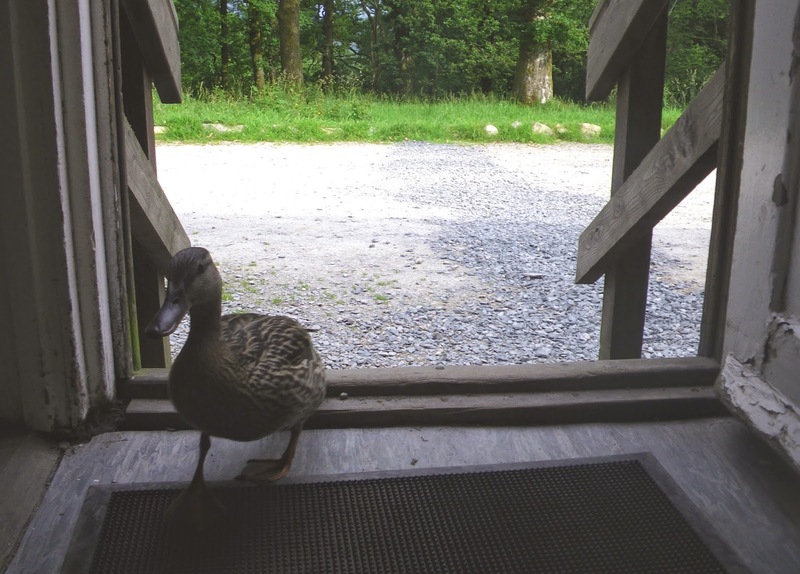 On occasion a local duck has turned up and wandered proprietarily in for a quick look around, before exiting in its own good time. More dramatically, this summer one of our volunteer groups came in to the Acland block kitchen to find a Bullfinch hiding under the kitchen shelves, with a Sparrowhawk perched inside on the windowsill looking mighty peeved! They caught this one by throwing a towel over it and released it outside, where it flew off unharmed – certainly not something you want eyeing up your sausages in the kitchen …. Most of the time though, our guest are invited. Recently we played host to the Fix the Fells lengthsmen for their annual Xmas bash, an event we’ve been proud to hold here for the last five years now. 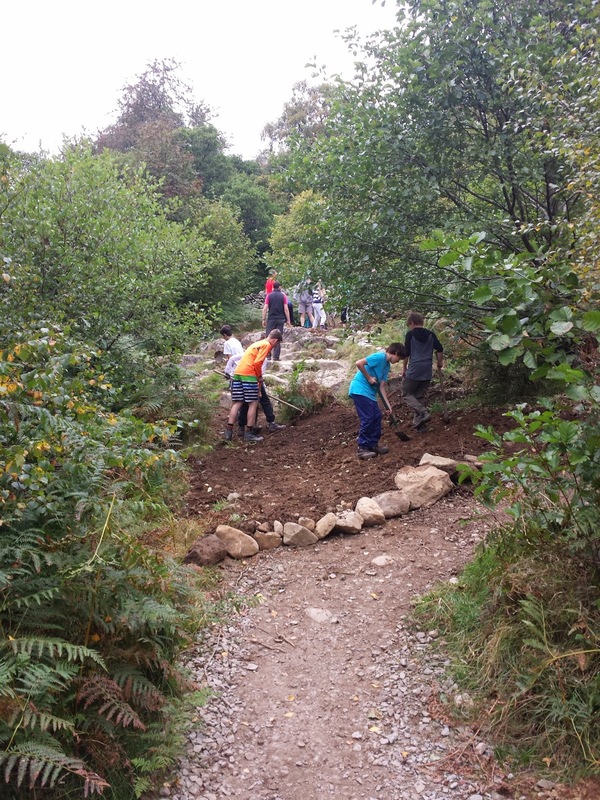 Around 35 of these fantastic regular volunteers spent a couple of days working with us and the South Lakes upland path team, culminating in a Saturday night feast of fun …. and food, of course. 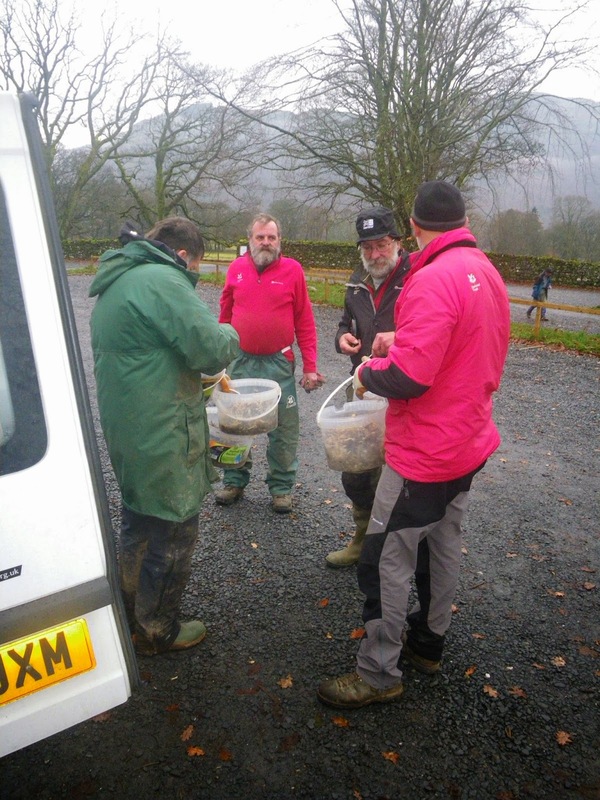 This year the lengthsmen have once again broken all their own records on the amount of volunteering days they’ve contributed to Fix the Fells, so there was plenty to celebrate. We’re looking forward to next year now and welcoming many more guests through our doors. And while you can never be sure, we’re hopeful there won’t be any need to throw a towel over any of them! On Saturday the 15th November 60 volunteers gathered for what's becoming the annual Monk Coniston garden bash. 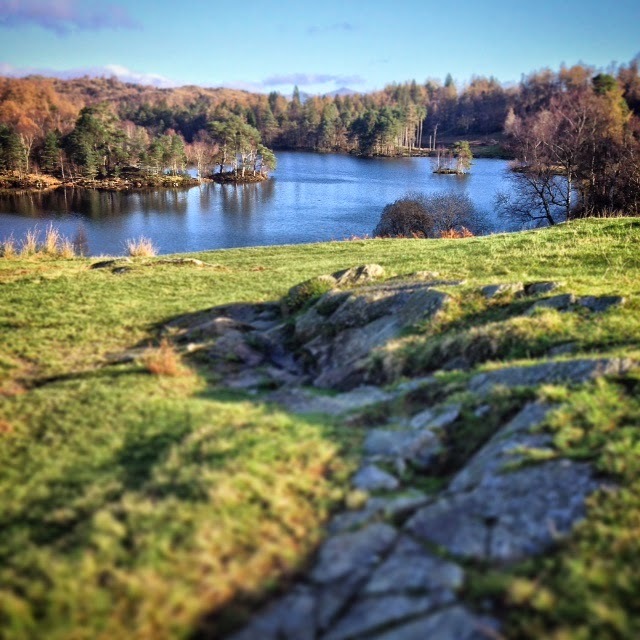 Monk Coniston was the home of James Garth Marshall who created Tarn Hows, what's less well known is that he landscaped the grounds, created a network of footpaths and planted a collection of specimen trees. Over the years the views have been lost and the specimen trees buried under more and more rhody - you can't see the (specimen) trees for the woods! Helen & John who manage the site for HF Holidays (NT tenants) gathered their volunteers and split them into 4 groups, each with a separate mission clearing paths, clearing the old Ha-ha, clearing views - each group did so much clearing that by dinner there were 4 large fires to burn the waste. Once the areas are cleared the rhody can be managed more easily and Helen's regular garden volunteers can keep on top of the bramble and other vegetation. John and Helen said "The formula absolutely works - everyone involved brought tons of enthusiasm and worked tirelessly during the day...... the level of gardening input was only matched by the volume of conversation at dinner in the evening! The weekend is a fantastic blend of hard work and sociability"
I suspect that after the day's work that all the volunteers put in that they all slept really well no doubt helped by the fact that Barngates brewery donated a barrel a 'cracker' for the evening! Christmas is fast approaching and the time has come to make sure that a few jobs are done so that people can have a memorable experience here. On Friars Crag we have one of the most popular Lake District walks and it is a special favourite of both visitors and local residents over the Christmas period. For many people an outing in the fresh air along the lake shore seems to be as much a part of Christmas Day as the turkey dinner so we like to make sure that the path through the wood from the car park and along the lake is in good condition. So my volunteers joined me in a clearing accumulated leaf mould from the path surface. If we don’t do this regularly the surface becomes slippery underfoot but, just as important is that, if we don’t clear it, the path will become overwhelmed by the debris and vegetation that quickly invades. Clearing it extends the life of the dirt scree surface. As they usually do, my volunteers did a superb job. One of the good things about working there is that we meet so many people. We’ve had a few days of really good weather with a lot of people taking the opportunity for a short holiday and of course there are regular local walkers who have a sense of ownership and stewardship of the area. Chatting with them is not only enjoyable but it is an important way of finding out if our work is achieving what we want it to. The Trust’s work is all about preserving and protecting for ever, for everyone so it’s good to hear a wide range of views. I’ve been helping Roy clear footpaths on Friars Crag but the best bit was that I met Stanley who can run really fast. When I was a puppy, he could run rings round me. Now I just wear him down. It’s great. 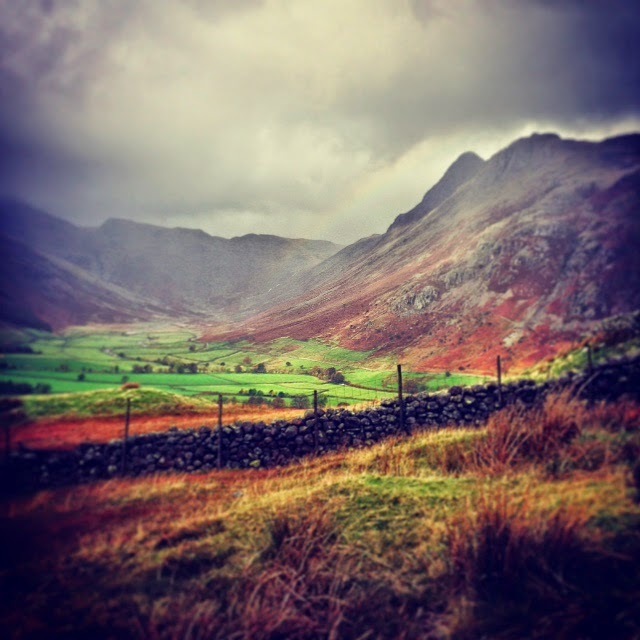 The Langdale Valley looking over Mickleden. 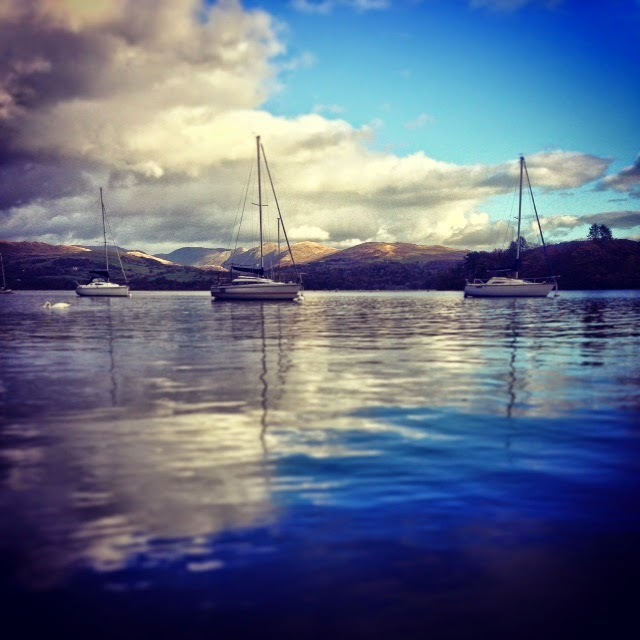 I consider myself to be quite fortunate at times with the amount of travelling I do when patrolling the South lakes. I get to see some of the most iconic views of this beautiful landscape from the gentle rolling fells on the western shore of Windermere and Claife, to the carved out valley of the Langdales where the pike 'o' stickle’s dome like obilisque can be seen rising out of the ground. The other day I was stopped by a gentleman at Blea Tarn, after the initial startle of being approached from behind in one of the quietest spots in our portfolio he went on to ask me how to get to hard knot pass and Wasdale. I gave him his directions and inquired what his journey entailed? ‘photography’ he replied. As you can imagine, the Lake District is a photography location for professionals and amateurs alike. However this gentleman went on to tell me stories of his past, and how he was hired by popular magazines and newspapers to ‘camp out’ in the wild and get some iconic and moody photos for publication -- A dream job for many. In contrast however, his career went in a different way and now some 20 years or so later he is looking to reinvigorate his interest in landscape photography. to my photo. See point 4 below. I too have a photography background, and like him I was studio trained using 35mm and medium format cameras. Back then, if you was planning a shoot of any kind your kitbag would have comprised of more than one camera, several lens’s and as much film you could carry (you only had 32 go’s at taking a picture back then kids). Times have moved on, and now good quality digital cameras are affordable and in many cases come complete with your mobile phone. So what I would like to do is give you some basic observations on taking a memorable picture. I’ve included some of my own photos I have taken whilst on my journey, I don't by any means claim that they are perfect, but they should highlight some of the points I've outlined here. I have also provided links which go into more detail of what I describe here …. And yes, I am very lucky to live and work here. Get off the track - Look at where you are, don’t take your photograph from the standard point of view on a footpath. If it’s safe, and OK to do so, move closer to your intended target, or maybe get higher, or lower to the ground for some depth. Lighting - You’ll always get a better lit photograph when the sun is behind you, for more dramatic photography head out early, for what is called the ‘golden hour’, this is the first hour after sunrise, or before sunset. Maybe stay at one of our campsites, to make sure you can get up and out for the sunrise. Composition - Remember the rule of thirds, in simple terms look at breaking your photograph into 3’s this gives you a much more balanced photo, and is more pleasing to the eye. Click here to learn more about this subject. Break the rules - Landscape photos don’t need to be taken in a landscape format. Try breaking the rules a little, taking a photo of the fells in portrait gives you a sense of drama and scale. In the square, it gives you a much tighter shot. Most importantly, think about having foreground interest, such as a rock formation, or a dry stone wall maybe? And finally, don’t rush! - I see so many people taking photos out of car windows, (The origin of this blog) or running from their car to a fence and back again. To truly say you’ve been there you need to absorb what’s around you, and really feel the connection. Sometimes, I like to keep some moments to myself and not take a picture at all. I use an Iphone to take my photos, and I make use of the filters that are available. These vary from adding a vignette, increasing the saturation or the brightness and the contrast. Swift water, fixing paths, felling trees and hunting for drains! It’s hard to believe that it is now 3 years since I last renewed my Swift Water Rescue Technician ticket for the mountain rescue team but last weekend was time to do it again. This is one of those occasions when it is essential to have a clear, concise briefing about what we will be doing. Once the rescue begins the noise of the water makes communication difficult and we cannot use radio equipment where it is going to be drenched. So it is vital that we have a Plan A, a Plan B and clear signals if and when we have to change from one to the other. It sounds simple but of course needs to be very well planned to actually do it. As ever, it was a really good weekend. 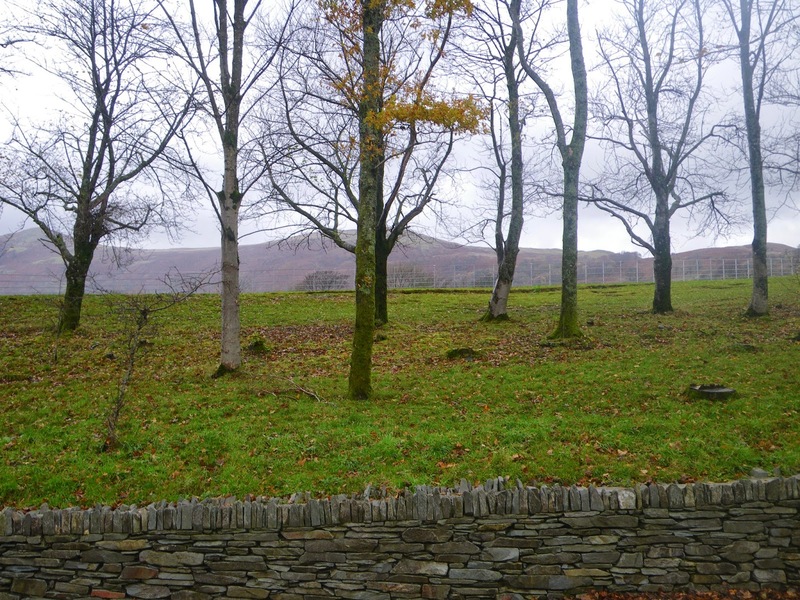 Once back at work, I returned to a project in Braithwaite, one of our lovely Lake District villages. As the village has developed over generations, layers of drainage systems have been installed and sometimes their exact position is long forgotten. There have been some flooding problems and I have been working with the Parish Council and residents of the village to decide how to solve them. During my round of knocking on doors to explain what we are going to do, I came across one resident who remembered the installation of a land drain and showed me its position. This is going to be a very useful find because we can feed a new drain into it. Later in the week I returned to Cat Gill with Leila, our academy ranger, and some of the guys from the footpath team. You might recall that I was up there recently to fell some trees across a short cut that people have started to use. Unfortunately it is in a position where it could develop into serious erosion quite quickly so I want to discourage its use as soon as possible. The last time I looked at this, it turned out to be too windy to fell the trees as accurately as I wanted them but this time was successful. As I did that, the footpath team improved the condition of part of the pitched path. Most people do prefer to use a well-built and maintained path so we think that problem will be solved now. I’ve been playing in the woods. It’s great. I love running around and I went to play with the footpath team. They think I’m crazy. You can't beat a good old adventure. You know the kind, good friends, amazing scenery, hopefully some nice weather. Well all of these aligned this weekend just in time for Rangers Clair and Sarah to have an adventure over to the National Trust campsite in Wasdale, a splendid wee spot! 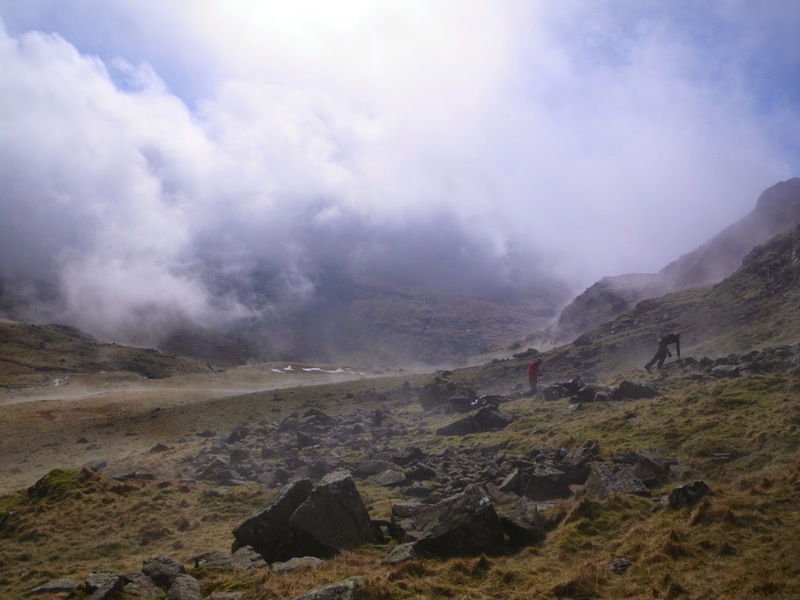 Starting from the NT car park at Old Dungeon Ghyll we shouldered our packs and headed on our way. It was looking to be a beautiful day so our plans included Great End, Scafell and Lingmell before finally arriving at the campsite in Wasdale and our tipi for the night! As you can tell we were really lucky with the weather, but even if it had been wet that wouldn't have been a problem as the tipi we stayed in was just plain awesome! If you've not stayed in one before we would highly recommend it. The one we used on the NT site in Wasdale was all we needed it to be, simple and spacious with a brilliant wood-burner that kicked out the heat. As it says on their website all you need to bring is what you'd bring if you were camping normally, minus the tent! More information can be found here. Getting ready for another day on the fell. With a toasty night in the tipi and everyone well rested and fueled up on porridge it was time to make our way back to Langdale. With most of the high fells covered on our way over, we decided to take a more leisurely route home, taking in Sprinkling and Styhead Tarns, Seathwaite Fell and Rossett Pike. Again the weather was glorious, something we took full advantage of! By the time we reached the our car down at Old Dungeon Ghyll our legs were weary and the night well and truly drawing in, but it had been a fabulous adventure and I would encourage anyone with a spare few days to grab a couple of friends and give it a go! The campsites have lots of great offers on at the moment including 25% off their tipis mid week until 16th December (more info here). The campsites also offer a green discount to encourage you to arrive minus a car, whether that be by public transport, foot or bike. So there's no excuse, get out there and find your adventure!